Fenland Flat Roofing’s main activities are the supply and fitting of specialist flat roofing systems and structural waterproofing. Fenland supplied and installed single ply membrane to the curved walkways and external shoulders to the main roof. 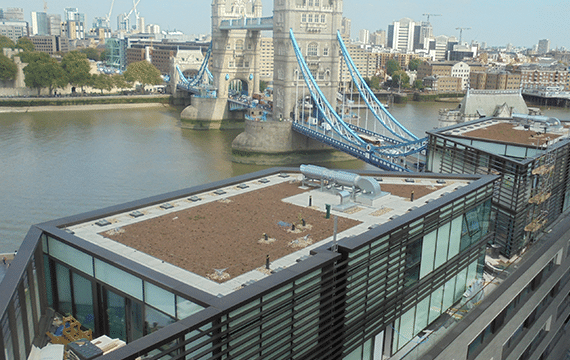 Fenland installed hot melt roofing, inverted insulation, metal capping and access hatches at two Canary Wharf buildings. Fenland supplied and installed single ply membrane to the main roof of the hanger. Why Choose Fenland Flat Roofing? Formed in 1976, the company’s capabilities make it a leading supplier of bespoke solutions across a wide number of sectors, including residential, commercial and public sector. Types of work include market leading single ply membranes, structural waterproofing, liquid coatings, green and bio-diverse roofs, built up felt systems and metal decks. Fenland are a specialist roofing contractor for large commercial projects. Our previous work includes projects across many different sectors from residential to commercial. Previous projects include the HSBC World HQ in Canary Wharf, The Sterling Award winning Duxford Aircraft Museum, The Royal London Hospital and the new NAPP Laboratories on Cambridge’s Science Park. Projects vary greatly in size from 50msq to 20,000msq and value from £1K to £1.5M.